I've only blogged once this week. I don't know why, really, other than that I've felt kind of tired and lazy lately. What was that? Don't you always feel tired and lazy, you say? So, remember when I was complaining about the ripped chair that came and replaced my tv that no one wanted? Well, here's the silver lining to that story. Last night, the door bell rang, which normally irritates me because, thanks to my father, I am genetically programmed to be irritated when the door bell/phone rings. But when the kids are here it's a lot less irritating. So we answered the door. A bunch of young people were standing there and they said they were from a church across the street (not my church) and they were having an activity called Bigger Better. Sounded familiar, I thought. And slightly serendipitous. I started to shake with excitement. They presented us with this. And asked if we had anything bigger or better we could give them. Mwahahahahahahaha. That's my evil laugh. "Why yes, I do, indeed, have something bigger and better to get rid of. I mean give you." I hailed the man to come and erect the leather chair I moved into his garage when he wouldn't move it out of my living room. The boys saw it and declared themselves the winners. Ohhhh, someone's the winner here boys, and I don't think it's you! I watched them cart that thing all over the neighbourhood for a few hours before they disappeared in a white truck. Moving on. Last week I got a text from the man. 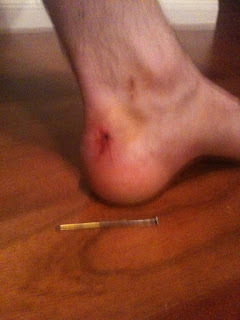 It read: Guess who just shot a nail through his ankle? Spoiler, it's me. ROAR. And that's it. He likes to torture me so. I soon found out he was in Urgent Care getting it removed. He brought his own nail puller because apparently he's the kind of guy that brings his own tools to the hospital. That must be an Eagle Scout thing. Always Be Prepared? No? X-rays showed that it went right through the inside of his Achilles tendon and straight out the other side. He saved the nail. So I could take a picture. For my blog. Good man. The bad news? They had to cut his work boot to smithereens. Wait.....no. That's not the bad news. 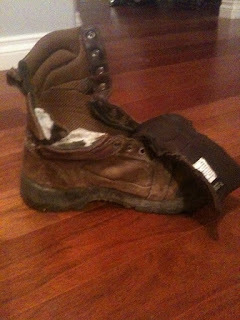 But the good news is that all that money we give to WCB is going to come back to us and buy him a new pair of boots. Lately people have found my blog by googling a variety of random things. Like, "barf bucket", "dance hard", "fajita cookers" and "goals of having a party in your house". I don't know where to start with this. But if I were to try I would conclude that someone is throwing a party in their house, with very specific goals and are planning on some serious dancing that may require the use of a barf bucket because, probably, they ate off a fajita cooker that they may or may not have found in the garbage and they most certainly want me to come. And consider yourself caught up. Love how you played the Bigger Better game! Win-Win! And yuck to hubby's foot! This post is all kinds of awesome. Even awesomely gross (anything involving an Achilles...it freaks me out when people walk on it by accident).